This is totally a Jamie Oliver recipe and one of the reasons I love his food. The simply delicious combination of squid with black pudding stuffing and a sticky cherry tomato sauce can’t be beat. It may seem strange to combine meat with squid but this combination really works. If you are not in the UK you may need to resort to the internet to find black pudding but I assure you it is worth it. I’ve tried this with chorizo but the flavor combination is just not as good. Squid tubes can be purchased from a good fish shop already cleaned and prepared. I find the medium sized squid easier to stuff and cook than the smaller squid but if you are serving this as an appetizer the smaller squid might be a better choice. The black pudding, bacon and onions are cooked up in a frying and then tossed into a food processor along with thyme, lemon zest and a handful of fresh bread crumbs. The tubes are stuffed and then seared in a saute pan. Add chilli flakes, garlic and the cherry tomatoes, cover and simmer for 10 minutes. A green salad and rice served alongside to absorb all those lovely juices and you have yourself a delish easy meal. 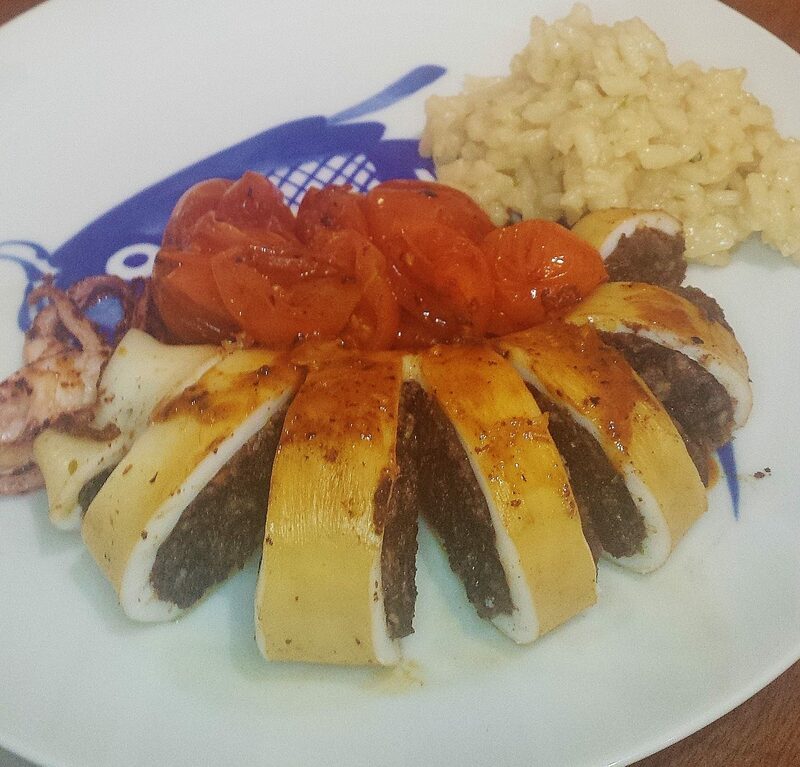 A delish combination of squid and black pudding served with a sticky tomato sauce. Step 1 Heat a tablespoon of olive oil in a frying pan on medium heat. Add the bacon or pancetta. When it’s sizzling add the onion and thyme and cook gently until the onion is soft. Stir in the black pudding, turn the heat up a little and fry until everything is crisp and hot. Pour the contents of the pan into a food processor, add the breadcrumbs and lemon zest and pulse until it all holds together. Season with salt and pepper and set aside. Step 2 Spoon the cooled black pudding mixture into the squid tubes (don’t overstuff) and secure the open ends with a toothpick. Rub the stuffed squid with a bit of oil, salt and pepper. Step 3 Sear the squid tubes and tentacles in a pan with little olive oil over medium heat until light brown on all sides. Add the chilli and garlic, lower the heat a bit and when the garlic is golden brown add the tomatoes. Cover with a lid and simmer gently for about 10 minutes, until the tomatoes have cooked into a lovely sticky sauce and the squid is hot all the way through. Step 4 Taste the sauce and season with salt, pepper and perhaps a squeeze of lemon.